A small-arms cartridge consists of a cartridge case, a primer, propellant (gunpowder), and a bullet or projectile (Figure 1.14). Blank cartridges are sealed with paper disks instead of a bullet or have a crimped neck. Dummy cartridges have neither a primer nor powder. Some dummy cartridges contain inert granular material that simulates powder. Figure 1.14 Small arms cartridge with bullet, powder, cartridge, case and primer. plastic materials have been used experimentally. Brass, plastic, and paper are used for shot-shell tubes. The main function of the cartridge case is to expand and seal the chamber against rearward escape of gases when the cartridge is fired. When a brass cartridge is fired in a weapon, the gas pressure produced by the burning of the propellant expands the case tightly against the walls of the chamber. If the brass is tempered to the correct hardness, it will spring back to approximately its original dimensions and make the case easy to extract. If the brass is too soft, it will not spring back and will make extraction difficult. If the brass is too hard — that is, brittle — it will crack. There are three general shapes for cartridge cases: straight, bottleneck, and tapered. Almost all pistol cartridges are straight, whereas almost all rifle cartridges are bottle-necked. The bottle-neck design permits more powder to be packed in a shorter, fatter cartridge than would be possible in a straight cartridge, where the lumen is approximately the diameter of the bullet. Cartridges with tapered cases are virtually obsolete. Figure 1.15 Cartridge case head designs: (a) belted; (b) rebated; (c) rimless; (d) semi-rimmed; (e) rimmed. Rimmed cartridge cases have an extractor flange that is larger than the diameter of the cartridge case body. The letter R is added after case length numbers in the metric system of caliber designation. Semi-rimmed cartridge cases have an extractor flange that is larger in diameter than the cartridge case body, but they also have a groove around the case body just in front of the flange. The metric designation for these cartridges is SR.
Rimless cartridge cases have an extractor flange whose diameter is the same as that of the cartridge case body and also have a groove around the body of the case in front of the flange. In the metric system of caliber designation, no letter is used for this type of cartridge case. A rebated cartridge case has an extractor flange that is smaller than the diameter of the case. A groove around the body of the case is present in front of the flange. The metric designation is RB. A belted cartridge case has a pronounced, raised belt encircling the cartridge case body in front of the groove in the body. The diameter of the extractor flange is immaterial. The metric designation is B. Virtually all cartridge cases have head stamps on their bases (Figure 1.16). The head stamp is a series of letters, numbers, symbols, and/or trade names. They are either imprinted or embossed on a cartridge case head for identification purposes. Civilian cartridges are usually marked with the initials or code of the manufacturer, as well as the caliber. Military cartridges are usually marked with the manufacturer's initials or code plus the last two numerals of the year of manufacture. The caliber may be designated as well. American military Match ammunition has the word "Match" or the letters "NM" (National Match) imprinted on it. Ammunition meeting NATO specifications carries the NATO symbol which is a cross within a circle (Figure 1.16). Figure 1.16 Headstamps on centerfire cartridges: (a) .38 Special cartridge manufactured by 3 D; (b) rifle cartridge manufactured by Remington-Peters of caliber .30-30 Winchester; (c) rifle cartridge manufactured by Fabrique Nationale in 1955 with a NATO symbol. Head stamps are not necessarily reliable indicators of the caliber of the particular cartridge case or the manufacturer because a cartridge case may have been reformed to another caliber. Thus a .308 cartridge case may have been necked down to a .243 cartridge. Commercial concerns that buy large quantities of ammunition may have their name stamped on the cartridge cases rather than the designation of the actual manufacturer. Ammunition manufactured by Russia and Japan during World War II and some 7.62 X 39 mm ammunition manufactured by the U.S. government during the Vietnam war do not have head stamps. Occasionally, a cartridge case may be seen with a surcharge. These are markings added to the base of the cartridge after the original head stamp has been formed. They are not necessarily applied in the plant that performs the original head stamp operation on the cartridge case, and they may indicate that the cartridge has been reloaded. Handgun ammunition with a head stamps reading +P or +P+ indicates that the ammunition is loaded to higher pressures than normal for the particular caliber cartridge. Small-arms cartridges are classified as centerfire or rimfire, depending on the location of the primer. In centerfire cartridges, the primer is located in the center of the base of the cartridge case. There are two types of primers for metallic cartridges: Boxer and Berdan. American centerfire rifle and pistol cartridges have Boxer primers (Blazer® ammunition is the exception). A Boxer primer consists of a brass or gilding-metal cup, a pellet containing a sensitive explosive, a paper disk and a brass anvil (Figure 1.17). These component parts are assembled to form a complete primer. The Boxer primer has a single large flash hole in the bottom of the case. European metallic cartridges traditionally are loaded with Berdan primers. The Berdan primer differs from the American Boxer primer in that it has no integral anvil. Instead, the anvil is built into the cartridge case and forms a projection in the primer pocket (Figure 1.18). Berdan primers have two flash holes in the primer pocket. Shot-shell primers are a variant of Boxer primers used in metallic cartridges. The main difference is that the shotshell primer has its own supporting cup — the battery cup — which encloses the anvil, the paper disk, the priming mixture, and the primer cup. This battery cup primer is inserted in the base of the shotgun shell. Primers made for rifles and pistols differ in construction in that the cups of pistol primers are made with thinner metal. The rifle primer also has a mixture that burns with a more intense and sustained flame. Primers come in five sizes: large rifle, small rifle, large pistol, small pistol, and shotgun. The large primers measure 0.210 in. in diameter; the small 0.175 in. and shotgun primers 0.243. Magnum primers (either rifle or pistol) produce a more intense and sustained flame, which is necessary for better ignition in Magnum cartridges. 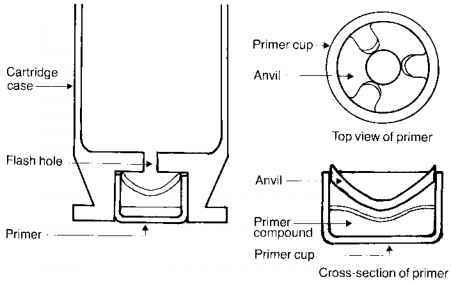 When a weapon is fired, the firing pin strikes the center of the primer cup, compressing the primer composition between the cup and anvil and causing the composition to explode. The vents in the anvil allow the flame to pass through the flash hole(s) into the cartridge case and thereby igniting the propellant. Primer compounds originally were made of fulminate of mercury. On firing, free mercury was released. This amalgamated with the brass of the cartridge case, making it brittle and ruining it for reloading. In addition, storage of ammunition containing mercury primers for long periods of time led to deterioration of the brass because of the mercury. Mercury compounds were then replaced with chlorate compounds. Unfortunately, on firing, these broke down to chloride salts, causing severe rusting of the barrels. All primers currently manufactured in the U.S. use chemical ingredients that are non-mercuric and noncorrosive. The compounds that are used vary: lead styphnate, barium nitrate, and antimony sulfide are most commonly used. Most centerfire primers of either U.S. or foreign manufacture contain all three compounds. The detection of these compounds constitutes the basis for tests to determine whether an individual has fired a firearm. Blount Industries (CCI), Remington, Federal, and Winchester now manufacture some centerfire pistol ammunition that does not contain lead in the primer. Rimfire ammunition does not contain a primer assembly. 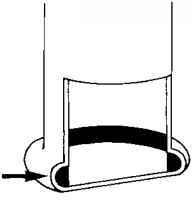 Instead, the primer composition is spun into the rim of the cartridge case with the propellant in intimate contact with this composition (Figure 1.19). On firing, the firing pin strikes the rim of the cartridge case, compressing the primer composition and initiating its detonation. The primer mixture used in .22 rimfire ammunition manufactured by Winchester and CCI contains compounds of lead and barium. Federal ammunition uses compounds of lead, barium, and antimony. Remington rimfire ammunition used to contain only lead compounds, but now uses compounds of lead and barium. Some Mexican manufactured rimfire ammunition uses only lead compounds in the primer. Until the end of the nineteenth century, all cartridges were loaded with black powder. Black powder is a mixture of charcoal, sulfur, and potassium nitrate. These materials were individually ground to a powder, mechanically mixed, ground together, incorporated with the help of moisture and pressed into hard cakes, dried, and then broken down into the desired granulation. In such a mixture, the charcoal is the fuel; the potassium nitrate the oxygen supplier or oxidizer while the sulfur gives the mixture more density and workability and makes it more readily ignitable. When black powder burns properly, it produces 44% of its original weight in gases and 56% in solid residues.1 These residues appear principally as a dense, white smoke. Figure 1.19 Cross-section of base of .22 rimfire cartridge with primer composition in rim of case (arrow). In 1884, Vieille, a French chemist, first synthesized an effective, practical form of what is now known as smokeless powder.2 Using alcohol and ether, he reduced nitrocellulose to a gelatinous colloid, which was rolled into sheets and cut into flakes. In 1887, Alfred Nobel developed a slightly different form of smokeless powder.2 Utilizing nitrocellulose that was not as highly nitrated as that used by Vieille, he colloided it with nitroglycerine and then dried, rolled, and cut it into flakes. These two types of smokeless powder are known as single-base and double-base powders, respectively. The physical configuration of individual powder grains can be disk, flake, or cylinder, whether the powder is single- or double-base. The next major step in the development of smokeless powder was the introduction of ball powder by Winchester in 1933.2 In ball powder, the nitrocellulose instead of being colloided is dissolved completely and the resultant lacquer is agitated under conditions to make it form into small balls that constitute the powder grains. By manipulation of the process, the diameter of the balls of powder can be controlled, whereas in an extra operation the balls of powder may be flattened between rollers, thus altering the surface area and thus the burning rate of the powder. True ball powder appears as small, uniform silver-black spheres or ovals having a shiny, reflective surface; flattened ball powder as irregular, flattened chips with a silver-black shiny surface. In most flattened ball powder one can find non-flattened spheres and ovoid grains. Between the extremes of true ball and flattened ball powder is a wide spectrum of physical variations. Smokeless powder is, theoretically, converted completely into gaseous products. Unlike black powder, it does not leave a significant residue in the bore. Smokeless powders burn at the surface only. Thus, the burning surface decreases continuously as the grains are consumed. This degressive burning, an unfavorable characteristic, can be overcome to a degree by putting a hole in the individual powder grain, with a resultant increase in the surface area as the grain burns. More commonly, chemical coating deterrents are applied to powder grains to slow the burning initially in order to make progressive burning powder. These grains of powder burn slowly at first and then rapidly. The grains of powder may also be coated with graphite to eliminate static electricity and facilitate the flow of powder while the cartridges are loaded. Rather than having a shiny black appearance, uncoated grains of powder are a pale-green color. Powder grains recovered from the skin or clothing after discharge of a gun may not be black, but rather, pale-green or beige due to losing the coating. The weight of the propellant charge in a cartridge is adjusted for each lot of propellant to give the required muzzle velocity for the weight of the bullet with a chamber pressure within the limits prescribed for the weapon. Pyrodex, a "synthetic" black powder, was developed to replace black powder in weapons in which only black powder can be used. It was developed for two reasons: first, there is a shortage of black powder and second, there are a number of restrictions in the United States put on the sale and storage of black powder because of its explosive properties. As Pyrodex is a nitrocellulose-based powder, it is considerably safer than black powder and avoids these restrictions. The problem with developing a replacement for black powder is that black powder burns at substantially the same rate whether unconfined or fired in a weapon. Smokeless powder, however, burns slowly when unconfined, requiring about 1000 lb/in. of pressure to burn consistently. As pressure increases, it burns atanincreasing rate, producingpres-sures that exceed those that can be tolerated byblackpowderfirearms. Pyrodex has more bulk than black powder, with an equal volume of Pyrodex having about 88% of the weightof blackpowder. In weapons chambered for black powder, Pyrodex is loadedbulkforbulkwithblackpowder, not by weight. The pressures and velocitiesgeneratedare, thus, compatible with those achieved with black powder. The bullet is that part of the cartridgethatleavesthe muzzleof thefirearm when it discharges. Bullets were originallyleadspheres. These workedsatis-factorily with smooth-bore weapons, inwhichaccuracyandlong range were not expected. By the early nineteenth century, however, thesuperiorityof the muzzle-loading rifle over the smooth-bore musketwasaccepted. These rifled weapons had a greater range and considerablymoreaccuracy. Themain difficulty, however, was in reloading. Tomakesucha rifleshootaccurately, the bullet had to fit the bore. This qualificationmadethegundifficult to load and decreased the rate of fire. Thebullethad tobeforceddownthe barrel with a mallet. American riflemen developed a more rapid way of loading their rifles. They used a bullet thatwasslightlyunderborediameter. This bullet was wrapped in a greased patch of fabric, and the patch and the spherical bullet were rammed down the barrel together. This step speeded up the rate of loading to some degree, but it did not solve the problem. What was needed was to develop a bullet with a diameter less than the bore which would expand to fit the rifling grooves on firing and also would have a better aerodynamic shape than the ball. The solution was the Minie bullet, developed by Captain Charles Minie of the French Army.3 It originally consisted of a conical-shaped, hollow-based lead bullet into whose base an iron wedge was inserted. The bullet was smaller in diameter than the bore and could easily be pushed down the bore. On firing, the gases of combustion would drive the wedge into the base of the bullet, expanding the base of the Minie bullet to fit the rifling grooves and to seal the propellant gases behind the bullet. Subsequent research found that the wedge could be eliminated and that the propellant gases working on the hollow base alone were sufficient to flare out the base of the bullet and seal the bore. Soon after the development of the Minie bullet, breech-loading rifled weapons firing metallic cartridges were perfected. Thus, bullets could be made to bore diameter because it was not necessary to force them down the bore during the loading process. Modern bullets fall into two categories: lead- and metal-jacketed. Lead bullets were traditionally used only in revolvers and .22 rimfire cartridges; metal-jacketed bullets in automatic pistols and in high-velocity rifles. These generalizations, however, are no longer true. Lead bullets are made out of lead to which antimony and/or tin have been added to increase the hardness of the alloy. These bullets are lubricated with grease or lubricating compound to help prevent leading (lead fouling) of the barrel. Lead bullets generally, but not inevitably, have one or more cannelures, or grooves (Figure 1.20). The Federal Arms Company manufactured a .38 Special bullet that had no cannelures. In bullets with cannelures, the cartridge case neck is crimped into one groove with lubricating material placed in the other grooves. When the bullet is assembled in the cartridge case, the cannelures containing the lubricated material may be on the outside and readily visible or beneath the neck of the cartridge case and not visible. Some lead bullets are covered by an extremely thin coating of copper or copper alloy. This coating, which both hardens and lubricates the bullet, is called "gilding." It is approximately 0.001 in. in thickness. Copper gilding is used extensively in .22 high-velocity rimfire ammunition. Blount Industries electroplates some of its bullets with a thick, hard coat of copper such that on initial inspection one believes that one is dealing with a completely jacketed bullet. This coating covers the complete external surface of the bullet including the base. There are four general configurations of lead bullets: roundnose, wadcutter, semi-wadcutter and hollow-point (Figure 1.20). A roundnose lead bullet has a semiblunt, conical shape and a flat or bevelled base. The wadcutter bullet, which resembles a cylinder of lead, has a base that may be either bevelled or hollow. Wadcutter bullets are designed primarily for target use. Figure 1.20 Lead bullets: (a) round nose; (b) semi-wadcutter; (c) hollow-point; (d) wadcutter. The semi-wadcutter configuration is that of a truncated cone with a flat tip and a sharp shoulder of bore diameter at the base of the cone. The lead hollow-point bullet has a semi-wadcutter configuration with a cavity in the nose that is designed to facilitate expansion of the bullet upon impact with the target. Occasionally, lead bullets with a copper cup crimped to their base may be encountered. This cup is called a "gas check." It protects the bullet base from melting due to the high pressure and temperature of the propellant gases. Lead bullets ordinarily cannot be used in centerfire rifles, because the bullet would melt or fragment as it was driven down the barrel at high velocity. The bullet emerging from the barrel would be of bore diameter rather than groove diameter, as a result of the lead being stripped from the sides of the bullet. Jacketing is used in high-velocity rifles to prevent this fragmenting or melting. Some handloaders will load cast bullets of a very hard lead alloy in rifle cartridges. However, the powder loadings are reduced so that muzzle velocity usually does not exceed 2000 ft/sec. Such cast bullets may or may not have gas checks. Jacketed ammunition is used in semi-automatic pistols to prevent leading of the action and barrel as well as jams that would result if a large number of lead bullets were fired. These jams are due to the deposit of small fragments of lead on the ramp and in the action as the bullets are stripped from the magazine and propelled up the ramp into the chamber. Handloaders sometimes use lead bullets in reloading automatic pistol cartridges. Jacketed bullets have a lead or steel core covered by an outside jacket of gilding metal (copper and zinc), gilding metal-clad steel, cupro-nickel (copper and nickel), or aluminum. Jackets generally range from 0.0165 to 0.030 in. in thickness. Cannelures may be present in the jackets of such bullets to provide a recess into which the mouth of the case may be crimped. Jacketed bullets may be either full metal-jacketed or partial metal-jacketed. Military ammunition, both rifle and pistol, is loaded with full metal-jacketed bullets. Five different types of bullets are in use by the military. The most common is ball ammunition, which consists of a bullet with a lead or mild steel core covered by a full metal jacket. Armor-piercing ammunition has a hard steel core. A lead base and point filler may also be present. Tracer bullets consist of a full metal jacket, a lead core in the forward position, and tracer composition in the base. In some cartridges the composition is of two types: Tracer Dim and Tracer Bright. The Tracer Dim composition burns first, leaving a very dim or faint flame for a distance from the gun. This is followed by Tracer Bright. Use of the Tracer Dim composition initially prevents revealing the location of the gun. Incendiary bullets contain an incendiary composition. Armor-piercing incendiary bullets consist of the full metal jacket, a steel core, and incendiary material to cause a fire. Center-fire rifle ammunition used for hunting has always been loaded with partial metal-jacketed bullets. In these bullets, the metal jacket is open at the tip of the bullet to expose the lead core, while usually closed at the base. Until the 1960s, all ammunition intended for automatic pistols was loaded with full metal-jacketed bullets having a lead core. At this time, partial metal-jacketed ammunition was introduced for use in both auto-loading pistols and revolvers. Most handgun ammunition now used by police organizations is partial metal-jacketed. The two most common forms of partial metal-jacketed ammunition, whether for rifles or handguns, are the semi-jacketed soft-point and the semi-jacketed hollow-point type. The former style of bullet is most popular for rifles; the latter, for handguns. In some rifle ammunition, the lead tip may be covered by a very light secondary jacket, usually of aluminum, e.g., the Silver-Tip® while others may have an expanding device made of metal or plastic in the tip. The tip of the semi-jacketed soft-point is rounded or pointed in rifles and flattened in a semi-wadcutter configuration in handguns. 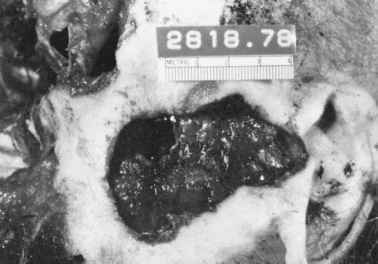 A varying degree of lead is exposed depending on the bullet design. The jacket at its junction with the exposed lead core may be scalloped or notched to aid in expansion ("mushrooming"). In semi-jacketed hollow-point ammunition the tip of the bullet has a cavity in it. Again, the partial metal jacket may be scalloped or notched to aid expansion or may extend down into the cavity. Occasionally encountered are full metal-jacketed semi-wadcutter and wadcutter handgun bullets used for target shooting. More common are handgun bullets in which the lead core is fully enclosed by a copper jacket. This bullet, in conjunction with lead-free primers in the cartridge case, is intended for use in indoor firing ranges and is so designed as to reduce lead pollution of the air. Caseless ammunition,4 while it has been tried in civilian weapons, is principally of interest to the military. This ammunition was developed to increase the probability of a bullet hitting a target in combat. Theoretically, a rifle firing short bursts of full-automatic fire at a very high rate of fire has a greater hit probability. The German military determined that, allowing for normal aiming error and assuming no recoil, at a range of 300 m, a circular dispersion of three shots would hit a target. With traditional cartridges and weapons, this is not possible due to recoil. After the first shot, the recoil causes the muzzle of the weapon to rise such that each successive shot is higher and to the right. If, however, the rate of fire was raised to 2000 rds/min, the three rounds would already have left the barrel before the weapon began to recoil. This rate of fire is not possible with conventional ammunition but is with caseless ammunition. As a result of this work, the German's developed the 4.7mm G11 Heckler and Koch rifle and the 4.73 X 33 mm DM11 caseless cartridge. The cartridge weighing 5.2 g, consists of a 8 X 8 X 32.8-mm block of propellant in which a 3.2 g bullet is completely embedded, such that only its tip is visible at the front end of a central hole. The bullet has a steel jacket and lead core. Muzzle velocity is 930 m/s — K.E. 1380 J. The propellant is a moderated high explosive mixed with a binder. At the rear, there is a primer consisting of a small pellet of explosive. A booster charge lies in between the primer and bullet. On ignition, the primer ignites the booster which propels the bullet forward engaging the rifling and acting as a seal for the gas from the propellant. At the same time, the booster ignites the main charge. Since there is no cartridge to be extracted, the weapon only has to load and fire. At full-automatic fire, the rate is approx 600 rds/min; at three shot burst it is 2200 rds/min. The first production weapons were apparently issued to German Special Forces in 1990. The end of the Cold War, the unification of Germany, defense cuts and the availability of large numbers of small arms at cheap prices has apparently led to the demise of this project for the present time.